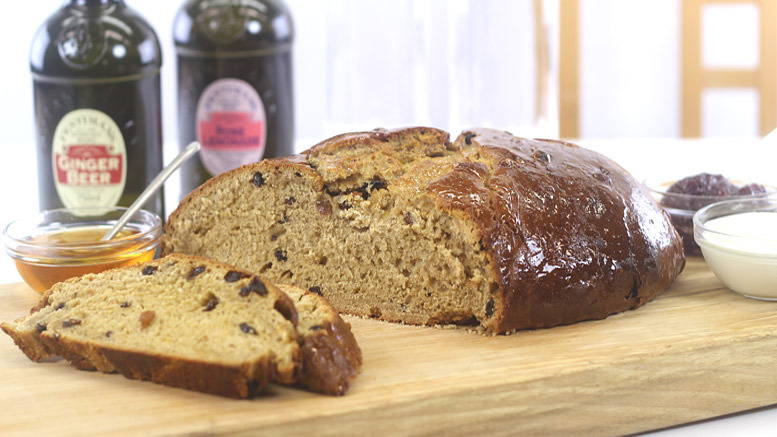 This recipe is a traditional and authentic Welsh Bara Brith recipe from Anglesey. It is made with yeast and without soaking the fruit in tea, which is the oldest Welsh (and most traditional) type of Bara Brith recipe, which was made on a ‘bread making day’ in Welsh villages for hundreds of years. It tastes wonderful eaten fresh from the oven, or the next day, if toasted and spread with butter, it tastes even better. As a note this type of Bara Brith is commonly eaten on St. David’s Day (1st March) or on Christmas Day for breakfast. If you would like to read more about Bara Brith’s and read various local recipes, ones using bicarbonate of soda as well as yeast, then please see these recipes: Bara Brith | Regional Recipes. In a jug add 200ml of warm water, stir in the black treacle to dissolve, then add in the yeast. Leave somewhere warm for the yeast to rise, for about 10 minutes. In a mixing bowl melt the butter and then beat in the eggs (when the butter has cooled a little) and then beat in the sugar. Add in all the dried fruit, salt and mixed spice. Then mix everything together thoroughly. In another bowl sieve in the flour and make a well in the centre. When the yeast has risen pour all the yeast, water and treacle into the well of the flour. 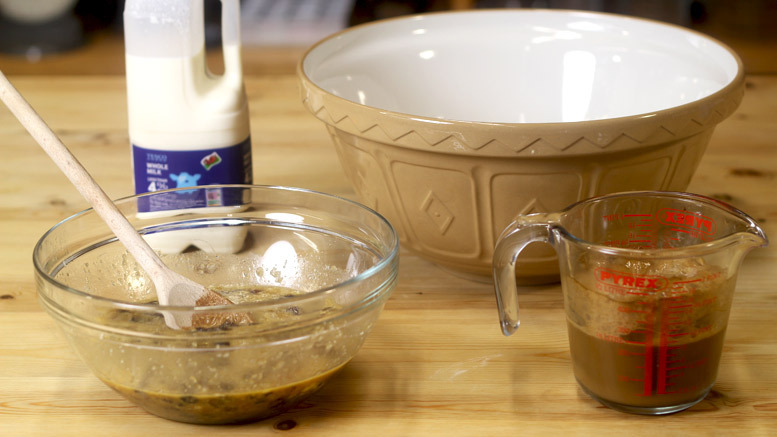 Using a wooden spoon fold the flour into the yeast and add in the warm milk. This should start coming together to make a soft dough, although it will be a little dry until the other ingredients are added in. 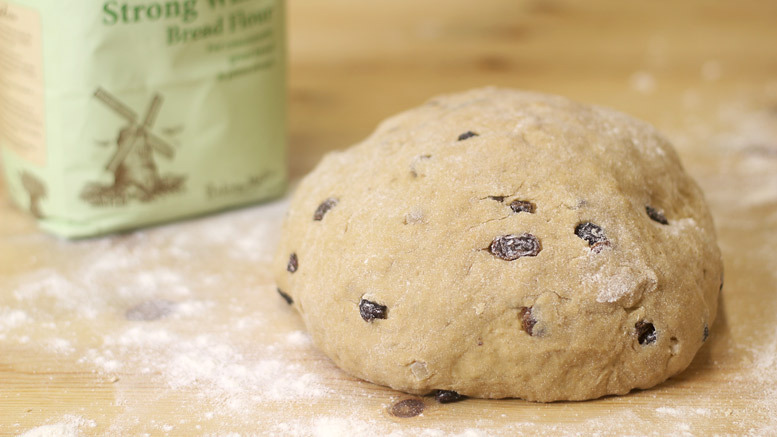 Add in all the other ingredients from the other bowl and mix together to make a fruity ‘speckled’ Bara Brith bread dough. If the mixture is a little wet add in some extra flour. On a floured work surface start kneading the fruit filled dough mixture. Knead it well for around 7 minutes. Depending on the dough add in extra flour (a small amount at a time) when kneading to make the dough elastic and less sticky. Kneading bread dough is a ‘push-pull’ technique to break the gluten and starches down in the flour. If sticking to the work surface sprinkle over a little extra flour, it will probably need a few casts of extra flour over the 7 minutes, but do not over do it. When ready it will become satiny and when pressed with a finger tip the indentation in the dough will rise back out. Kneading Technique: Hold one end of the dough with one hand and then with the palm of your other hand push the dough away from you, stretching it out. Once stretched (without breaking the dough) pull the dough back in and over with your fingers into a bigger lump once more. Give the dough a quarter turn then repeat. Giving the dough a quarter turn before stretching it back out works all of the dough over the 7 minutes and stretches the gluten out in different directions. Unlike a normal plain bread dough it will never stop being entirely ‘sticky’ because of the other ingredients like treacle and dried fruit added in, but once it has become soft and silky put it into a bowl, cover and leave to rise in a warm room for two hours. It should almost double in size, (it can take up to three hours). Grease two loaf tins with some melted butter – it is better to use the rectangular shaped bread tins rather than round cake tins to get the traditional shape of the Bara Brith. Or grease a flat baking tray. After two hours ‘knock back’ the risen dough (gently hit the excess air out of it) tip it out onto the work surface, bring together into a ball and either: divide it neatly into two and put each portion of the dough into the two prepared loaf tins, or: shape the dough into one loaf and place on the flat baking tray. Use a sharp knife and cut three short slices into the top of the bread to help expansion. Leave the dough to have its second rise in a warm room for 30 minutes. The second rise is important, it helps the bread dough re-establish itself before baking. After 30 minutes put the bread into a hot oven (220C) and bake for 60 minutes. Depending on your oven, a good bread baking tip is to turn the oven down to 180C after 40 minutes, then turn the oven off after 60 minutes, and leave the bread in the cooling oven for another 20 minutes. 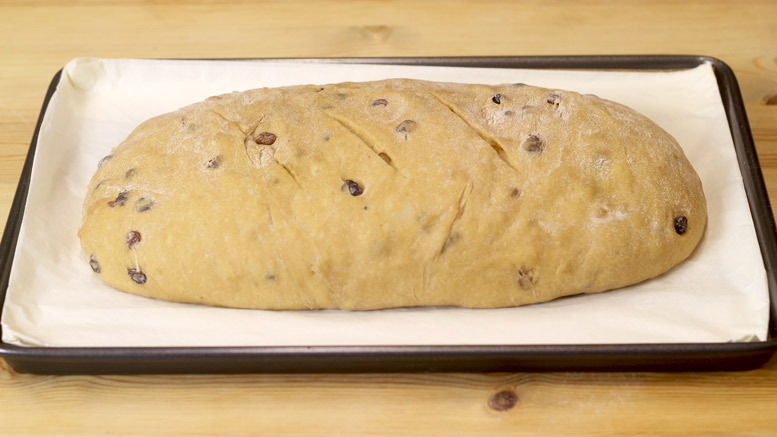 At the end of baking check the Bara Brith by pushing in a skewer to the centre of the breads – if it comes out clean and hot then remove to cool, if it comes out a little wet then turn the breads and bake them for up to another 30 minutes. The loaf should also sound hollow when you tap the base. When baked remove from the oven, and leave the Bara Brith to cool for twenty minutes, then turn out onto a cooling rack. 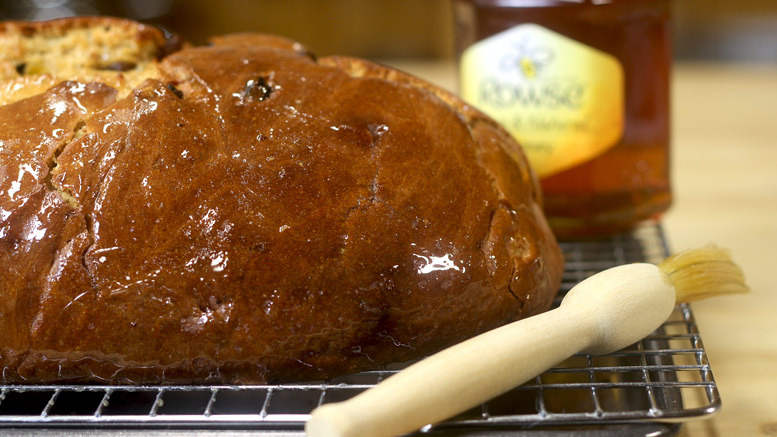 Once it has cooled, but is still warm, brush some runny honey all over the crusty bread top. Allow to cool further. Serve: Fresh baked Bara Brith is best eaten within two days, on the second day toast it. Ingredients: 1 lb. (4 cups) flour; 1 oz. yeast; 1/2 pint (1 cup) luke warm milk; 1 tsp white sugar; 3 oz. lard or butter; 1 egg; 2 heaped tbsp chopped mixed peel; 1/2 tsp mixed ground spice; 6 oz. seedless raisins; 3 tbsp currants; 4 tbsp brown sugar; pinch of salt; warm honey to glaze. Method: Warm the milk to tepid with the teaspoon of white sugar, crumble in the yeast and set aside for 10-20 minutes until it is frothy. Rub the fat into the flour, then stir in the peel, dried fruit, spices, brown sugar and salt. Make a well in the centre add the yeasted milk and the well-beaten egg. Mix to a soft dough, cover and leave in a warm place to rise for about 2 hours, until it is double in size. Turn onto a floured board and knead well, then put into a well-greased tin, cover again and leave for 30 minutes. Remove cover and put into a hot oven (400 F) for 20 minutes, then lower the heat to 325 F and bake for about 1 and 1/4 hours. The loaf will sound hollow when tapped on the bottom if it is properly cooked. Put onto a wire rack and brush the top with clear honey.